A shot line is dropped from a boat and used to mark the centre of the search area for a circular search. 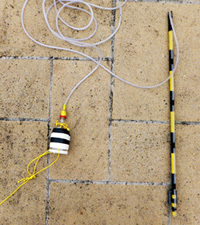 The shot has a 15-20kg weight tied to 10-12mm rope which is then attached to a large buoy or fender that acts as a float. The rope has to be longer than the depth of water it is deployed in. 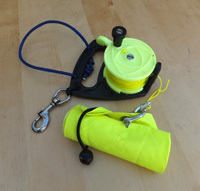 A small, deflated lifting bag can be attached to the shot weight, then once the shot needs to be recovered it can be inflated to help raise it to the surface. The distance line is attached to the shot line and is used to control the radius of a circular search. Larger reels are easier to use for this task than small ones, a McMahon Large Dive Reel is ideal. The line should be marked out in 5m increments so you can see how much line has been run out from the reel. The line can be marked using a permanent marker pen; one thick band for each 10m increment plus a thin band at 5m intervals is easy to understand. 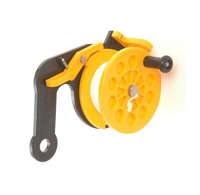 For accurate work a builder's fibreglass tape measure can be used instead of a reel and line. 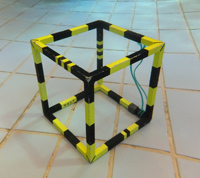 A delayed surface marker buoy or DSMB is used to mark the position of an object on the seabed found during a search. Open ended buoys are recommended. 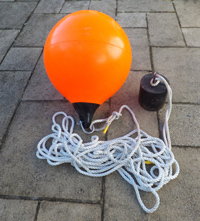 With this type, once a position fix has been recorded the buoy can be quickly deflated and rolled up by the boat crew, the diver can then wind in the reel allowing the buoy to be deployed again on the same dive. We use a Lumb CongeReel and a Bowstone marker buoy (code 7430). Two holes are drilled in the handle of the reel and shock cord is looped through and knotted together. 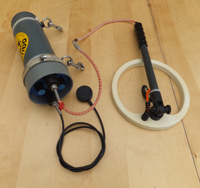 The loop of cord is then used to attach the rolled up marker buoy to the reel so that can be carried easily then released for deployment when needed. 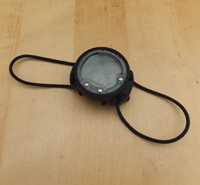 The diver's magnetic compass is used to position objects found during the search. The Suunto SK7 is ideal for this task. 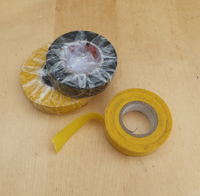 Flagging tape is used to mark objects found during the search so they can be found more easily later on. A GPS receiver reports its position on the Earth as a latitude and longitude so can be used to position the shot line for the search and to position any objects that are found and marked with a DSMB. 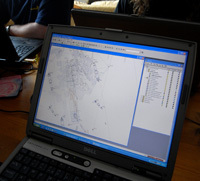 A Garmin GPSMap 76CSx works well and under static tests has provided positions to better than 2m using WAAS corrections. 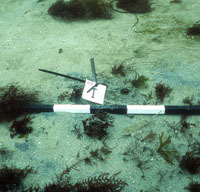 An underwater metal detector is used to detect metal objects on or just under the seabed. 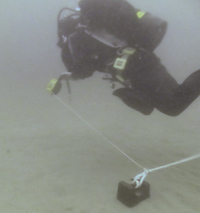 The unit shown here is an AquaScan AQ1B underwater metal detector. 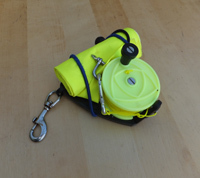 This unit has been modified so it stows away neatly when not in use leaving the diver's hands free. 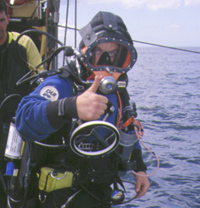 The main unit can be clipped under a diver's arm and the search coil clipped to the front of the diver's BC. A guard has also been placed around the connectors and control knobs. 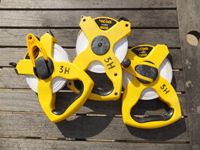 Standard builder's fibreglass tape measures can be used, less than 30m long in metric units. 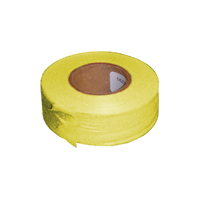 Yellow coloured tapes are more easily read than white when working underwater. 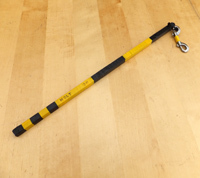 The zero end of a tape measure can be temporarily attached to a control point using a releasable cable tie. The drawing slate can be used for making notes or making sketches underwater. if you round off the sharp corners of the slate you are less likely to stab a hole in your drysuit. Papermate Non-Stop Disposable Mechanical Pencils work very well even after repeated dunking in sea water. 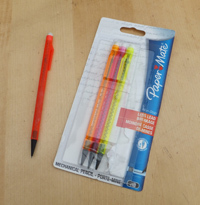 These pencils do float so should be firmly attached to your drawing slate. 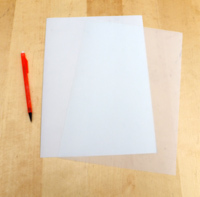 Waterproof paper is needed to write and make sketches underwater. 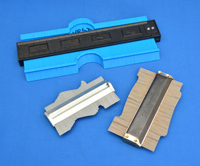 We recommend A4 pre-cut 75 micron Permatrace available from ArchTools for general work. We use F100TDL Non Adhesive Hydrocopy Film For Laser (100 microns) for pre-printed forms made using a laser printer. The waterproof paper is attached to the slate using PVC electrical tape, duct tape can be used but it sometimes leaves a sticky residue when removed. Standard forms make recording tasks much easier as they give you a hint about the information to record. 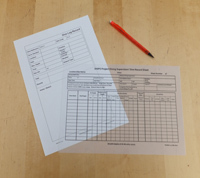 You can download suitable recording form templates here. Folding rules can be used to take detailed measurements underwater. Unfortunately many folding rules contain metal parts so corrode and fall apart after use underwater. We use ones that you can buy from the Nautical Archaeology Society as they survive repeated immersion in seawater. Control points are installed around the site and are used to attach tape measures for survey work. The best points have been found to be 500mm lengths of 10mm threaded stainless steel rod, these can be hammered into the seabed. 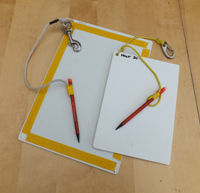 Each survey point and most large objects should be marked with a tag or label so they can be easily identified. 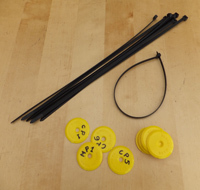 Yellow Disk-mark tags are available from York Survey. You can write on the disks with a black permanent marker pen (Sharpie) or engrave the letters more permanently with a hot soldering iron. 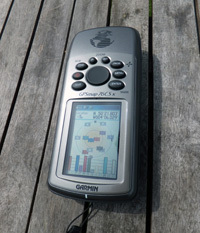 A digital dive computer can be used to measure depth underwater. Where possible the same dive computer should be used for all depth measurements on site. The instrument needs to be able to report depth to a resolution of 0.1m or better. Site Recorder software is used to process tape and depth measurements made during underwater surveys. 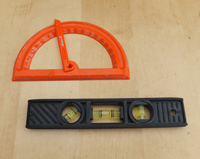 A protractor and bubble level can be used to measure the angle of a section of stucture on the site. The flat edge is placed against the structure and the bubble level placed alongside and levelled to provide a horizontal reference line. The angle of the structure can be read where the horizontal line meets the edge of the protractor. Planning or drawing frames are used for making detailed drawings of the seabed or wreck structure. We use 1m x 1m and 2m x 1m sections of 200mm steel reinforcing mesh, painted yellow. 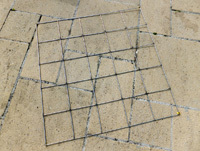 These are rugged planning frames and can be left on site between use. We also had some custom made from stainless steel. 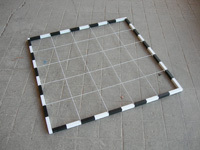 Alternatively, you can make a planning frame from 20mm square section plastic tubing and right angle connectors available at some hardware stores. The strings are thin elastic fed through holes drilled in the tubing. You will need to add weight to this kind of frame as otherwise it will float. 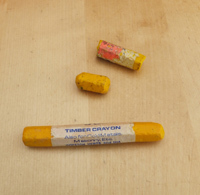 Yellow road crayon can be used to mark detail points on concreted iron objects. Road crayon is available from hardware stores and builders merchants. A bubble level can be used for high precision depth measurements. The bubble level is usually thought of as ancient technology; it uses a bubble of air to accurately transfer a known level from one point on the wreck site to other points on the site. Height measurements to points on ships structure can then be made from a common level. Wire brush and scraper can be used for cleaning weed from concreted iron guns and anchors before recording. Probes can be used to locate objects buried just beneath the surface of the seabed, we use stainless steel welding rods for this job. 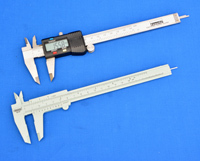 Vernier callipers are used to accurately measure the thickness of flat, round or bar shaped objects. 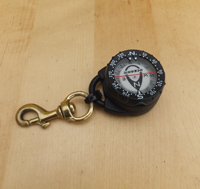 Plastic callipers can be used for initial finds recording when the finds are dirty or wet. Digital callipers can be used on dry finds. The digital readout makes reading the measurement very quick. Outside callipers can be used to measure the thickness of curved objects such as pottery. The outside curves can be fitted round the curves on the object being recorded. Digital outside callipers are particularly good for this as they report the thickness of the material while clamped together, the manual version have to be removed and measured against a rule. 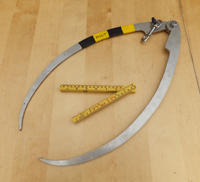 Large callipers can be used to measure the diameter of cannons and large pottery or for measuring the thickness of ship structure. 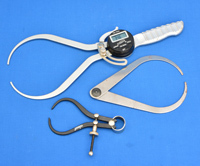 A profile gauge is used to record the shape of an object so the shape can be copied on to paper. Profile gauges are often used for recording the mouldings on cannons or for recording intricate shapes on pottery. 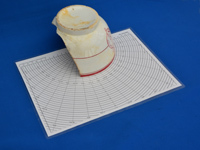 A radius chart is used to work out the radius of broken pieces of pottery where the diameter cannot be measured directly. The pottery object is placed on the chart and the edge to be measured lined up with the correct sized radius or circle drawn on the chart. The radius of the curve can then be read from the chart. Almost any camera available today will provide good enough images to be able to record sites and the objects found on them. Underwater housings are now available for some low-cost compact digital cameras so taking photographs underwater now does not have to be expensive. Photographic scales are used to provide a known distance reference when taking photographs above or under water. We use scales that are 1m and 500mm long, marked at 100mm intervals with one section marked at 20mm intervals. We use 10mm square section aluminium tubing available from hardware stores which is then covered with black and yellow electrical tape. Copper water pipe can be used instead of the aluminium tubing. The orientaion of an object on the site can be recorded if a north arrow is placed on it before it is photographed. It is important to record the true colour of some finds such as pottery but lighting conditions will affect the overall colour of a photograph. 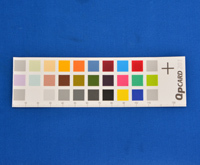 To correct for this variation in colour a standard colour chart can be included in the finds picture. Photographic scales are used to provide a known distance reference when taking photographs above or under water. For objects that are not flat it is often an advantage to include a 3D or cube scale in the photograph as it makes the photograph easier to interpret.